Russian Symbolism was an intellectual and artistic movement predominant at the end of the nineteenth and beginning of the twentieth century. It represented the Russian branch of the Symbolist movement in European art, and was mostly known for its contributions to Russian poetry. Symbolism developed after the Realist movement had exhausted itself. The era of the great Russian novel had come to an end. Symbolism represented a new artistic strategy, one that avoided the attempt to depict reality for one that attempted to evoke a feeling. Symbolism coincided with the decline of the role of the aristocracy and the rise of urban society. Primary influences on the movement were the irrational and mystical poetry and philosophy of Fyodor Tyutchev and Vladimir Solovyov, the operas of Richard Wagner, the philosophy of Arthur Schopenhauer and Friedrich Nietzsche, French Symbolist and Decadent poets such as Stéphane Mallarmé, Paul Verlaine, and Charles Baudelaire, and the dramas of Henrik Ibsen. The movement was inaugurated by Nikolai Minsky's article The Ancient Debate (1884) and Dmitry Merezhkovsky's book On the Causes of the Decline and on the New Trends in Contemporary Russian Literature (1892). Both writers promoted extreme individualism and deified the act of creation. Merezhkovsky was known for his poetry as well as a series of novels on god-men, among whom he counted Christ, Joan of Arc, Dante, Leonardo da Vinci, Napoleon, and (later) Hitler. His wife, Zinaida Gippius, also a major poet in the early days of the Symbolist movement, opened a salon in St Petersburg, which came to be known as the "headquarters of Russian decadence." 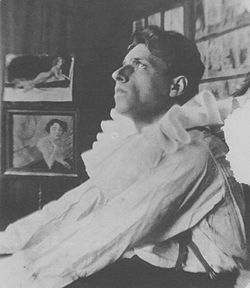 Vsevolod Meyerhold in his production of Alexander Blok's Puppet Show (1906). By the mid-1890s, Russian Symbolism was still mainly a set of theories and had few notable practitioners. Alexander Dobrolyubov published a book of verse in 1895, just before renouncing lay poetry in favor of wanderings from one monastery to another. Another talented author, Ivan Konevskoy, died at the age of 24. It was not until the new talent of Valery Bryusov emerged that Symbolist poetry became a major movement in Russian literature. In order to represent Symbolism as a movement of formidable following, Bryusov adopted numerous pen-names and published three volumes of his own verse, entitled Russian Symbolists. An Anthology (1894–1895). Bryusov's mystification proved successful—several young poets were attracted to Symbolism as the latest fashion in Russian letters. In addition to Bryusov, the most popular poets were Konstantin Balmont, who believed in first inspiration and sometimes intentionally left his verse unrevised, and the pessimistic Fyodor Sologub, who referred to himself as the bard of death. Though the reputations of many of these writers had faded by the mid-twentieth century, the influence of the Symbolist movement was nonetheless profound. This was especially true in the case of Innokenty Annensky, whose definitive collection of verse, Cypress Box, was published posthumously (1909). Sometimes cited as a Slavic counterpart to the accursed poets, Annensky managed to render into Russian the essential intonations of Baudelaire and Verlaine, while the subtle music, ominous allusions, arcane vocabulary, and the spell of minutely changing colors and odors in his poetry were all his own. His influence on the Acmeist school of Russian poetry was paramount. Russian Symbolism really flourished in the first decade of the twentieth century. Many new talents began to publish verse written in the Symbolist vein. These writers were especially indebted to the philosopher Vladimir Solovyov. The scholar Vyacheslav Ivanov, whose interests lay in ancient poetry, returned from Italy to establish a Dionysian club in St. Petersburg. His self-proclaimed principle was to engraft "archaic Miltonic diction" to Russian poetry. Maximilian Voloshin, best known for his poetry about the Russian revolution, opened a poetic salon at his villa in the Crimea. Jurgis Baltrušaitis, a close friend of Alexander Scriabin, whose poetry is characterized by mystical philosophy and mesmerizing sounds, was active in Lithuania. The Russian capital was often pictured by Symbolists as a depressing, nightmarish city. Of the new generation, two young poets, Alexander Blok and Andrei Bely, became the most renowned of the entire Russian Symbolist movement. Alexander Blok is widely considered to be one of the greatest, if not the greatest Russian poet of the twentieth century. He was often compared with Alexander Pushkin, and the whole Silver Age of Russian Poetry was sometimes styled the "Age of Blok." His early verse is impeccably musical and rich in sound. Later, he sought to introduce daring rhythmic patterns and uneven beats into his poetry. His mature poems are often based on the conflict between the platonic vision of ideal beauty and the disappointing reality of foul industrial outskirts. They are often characterized by an idiosyncratic use of color and spelling to express meaning. One of Blok's most famous and controversial poems was "The Twelve," a clear reference to the disciples of Christ, which described the march of twelve Bolshevik soldiers through the streets of revolutionary Petrograd in pseudo-religious terms. Andrei Bely, meanwhile, strove to forge a unity of prose, poetry, and music in much of his literature, as evidenced by the title of one of his early works, Symphonies in Prose. His fame rests primarily on the novel Petersburg, a philosophical and spiritual work influenced by James Joyce, featuring a highly unorthodox narrative style, fleeting allusions and distinctive rhythmic experimentation. Because of its complexity, the novel is generally regarded as the most complex in Russian literature. Vladimir Nabokov placed it second in his list of the greatest novels of the twentieth century, after Joyce's Ulysses. Other works of mention include the highly-influential theoretical tract entitled Symbolism (1910), which was instrumental in redefining the goals of the Symbolist movement, and the novel Kotik Letaev (1922), which traces the first glimpses of consciousness in a new-born baby. The city of St. Petersburg itself became one of the major symbols utilized by the second generation of Russian Symbolists. Blok's verses on the imperial capital bring to life an impressionistic picture of the city of a thousand illusions as a doomed world full of merchants and bourgeois figures. Various elemental forces (such as sunrises and sunsets, light and darkness, lightning and fire) assumed apocalyptic qualities, serving as portents of a great cataclysmic event that would change the earth and humanity forever. The Scythians and Mongols often found there way into the works of these poets, serving as symbols of future catastrophic wars. Due to the eschatological tendency inherent in the Russian Symbolist movement, many of the authors—including Blok, Bely, Bryusov—accepted the Russian Revolution as the next evolutionary step in their nation's history. Fyodor Sologub was the first writer to introduce the morbid, pessimistic elements characteristic of fin de siècle literature and philosophy into Russian prose. 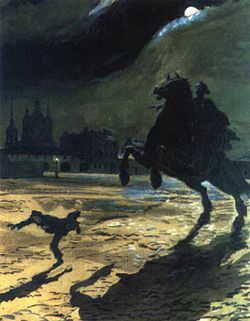 His most famous novel, The Petty Demon (1902), was an attempt to create a living portrait of the concept known in Russian as poshlost, (an idea whose meaning lies somewhere been evil and ordinary). His next large prose work, A Created Legend (a trilogy consisting of Drops of Blood, Queen Ortruda, and Smoke and Ash), contained many of the same characteristics, but presented a considerably more positive and hopeful view of the world. Valery Bryusov's novel The Fiery Angel is another example of this interest in the demonic. It tells the story of a sixteenth century German scholar and his attempts to win the love of a young woman whose spiritual integrity is seriously undermined by her participation in occult practices and her dealings with unclean forces. The novel served as the basis for Sergei Prokofiev's fourth opera. One Russian Symbolist who wrote mainly prose was Alexei Remizov. Drawing on medieval Russian literature, he grotesquely combined dreams, reality, and pure fancy in his works. Russian Symbolism had begun to lose its momentum in literature by the second decade of the twentieth century. Its major practitioners frequently conflicted in the pages of the journals Vesy, Zolotoe runo, and Pereval. Others wrestled for control of key printing houses. Meanwhile, many younger poets were drawn to the Acmeist movement, which distanced itself from excesses of Symbolism. Others joined the ranks of the Futurists, an iconoclastic group that sought to recreate art entirely, shunning all aesthetic conventions. 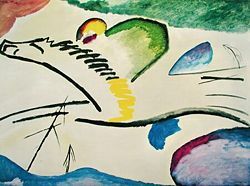 Wassily Kandinsky's emblem of the symbolic Blue Rider (1911). Probably the most important Russian Symbolist painter was Mikhail Vrubel, who achieved fame with a large mosaic-like canvas called Seated Demon (1890) and went mad while working on the dynamic and sinister Demon Downcast (1902). 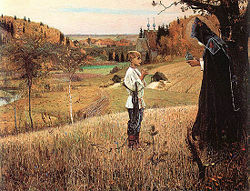 Other Symbolist painters associated with the World of Art magazine were Victor Borisov-Musatov, a follower of Puvis de Chavannes, Mikhail Nesterov, who painted religious subjects from medieval Russian history, Mstislav Dobuzhinsky, with his urbanistic phantasms, and Nicholas Roerich, whose paintings have been described as hermetic, or esoteric. Alexandre Benois designed Symbolist sets for Stravinsky's Petrushka in 1911. The foremost Symbolist composer was Alexander Scriabin, who in his First Symphony praised art as a kind of religion. Le Devin Poem (1905) sought to express “the evolution of the human spirit from pantheism to unity with the universe.” Poème de l'extase, first given in 1908 in New York, was accompanied by the elaborately selected color projections on a screen. In Scriabin's synthetic performances, music, poetry, dancing, colors, and scents were used so as to bring about “supreme, final ecstasy.” Similar ideas on the “stage fusion of all arts” were elaborated by Andrey Bely and Wassily Kandinsky. In the field of more traditional theater, The Cherry Orchard and some other later Chekhov plays have been described as steeped in Symbolism. Nevertheless, their first production by Konstantin Stanislavsky was as realistic as possible. 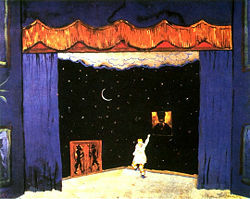 It is Meyerhold's production of Blok's Puppet Show (1906) that is usually cited as a high point of Symbolist theater. Two years later, Stanislavsky himself won international acclaim when he staged in the Moscow Art Theatre L'Oiseau Bleu, the latest of Maurice Maeterlinck's plays. In theory, we should mention the writings of Nikolay Evreinov, who insisted that theater is everything around us and that nature is full of theatrical conventions: desert flowers mimicking the stones; a mouse feigning death in order to escape a cat's claws; complicated dances of birds, etc. Theater, per Evreinov, is a universal symbol of existence. On the other hand, the actor, Mikhail Chekhov (the author's nephew), developed a particular system of Symbolist acting which still rivals the Stanislavsky system in popularity. This page was last modified on 21 July 2015, at 15:29.